With the rising awareness around head injuries in football, many parents are taking extra precautions when it comes to outfitting their children in the best youth football helmets. One way to mitigate the anxiety of your son stepping on the gridiron is to do your research and put your son in the most technologically advanced youth football helmet available. 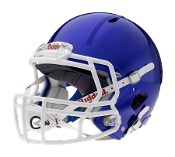 At Endzone Sports, we have done our own research based upon our decades of experience to offer the most technologically advanced youth football helmets available today. Not only do you want your sons football helmet to protect their head, you also want it to be comfortable and easy fitting. The biggest factor that turns youth athletes away from football is an uncomfortable helmet. This can also be a difficult situation for parents and coaches trying to take their son's helmet on and off while trying to keep their child comfortable. 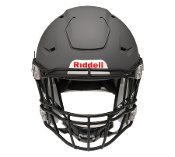 With our extensive experience in fitting youth football players, we have put together the easiest fitting and most comfortable helmets according to customer feedback. Please note: Youth Football Helmets are designed to offer ideal protection to football players up to high school. All youth helmets are NOCSAE certified. We encourage all of our customers to do their own research when it comes to purchasing a football helmet for their son, especially a youth helmet. 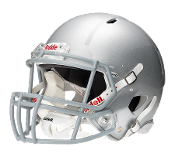 We are confident that based upon your own research and the demand of football players, you will find that the selection that we offer are in fact the best youth football helmets available.